On October 26 the union rejected management's retrenchment proposal, arguing that alternatives were available. On November 9, five union members, including the union general secretary, deputy general secretary and communications officer, received letters stating that they were being terminated within the framework of a voluntary redundancy program and requesting them to return the signed letters by November 12. They also learned that they were not scheduled to work the week of November 12. When the union responded that the members rejected termination, the 5 were given new letters stating that they were being terminated as part of an 'efficiency' program and should they refuse to sign they would receive no dismissal pay. Only one other worker besides the members of the independent union has been terminated, on medical grounds, making clear the discriminatory intent of this latest attack on union rights. The 5 union members reported for work on November 12 and, with the support of the union, have refused to leave the plant. The IUF is organizing solidarity and support through the independent federation of food workers' unions. 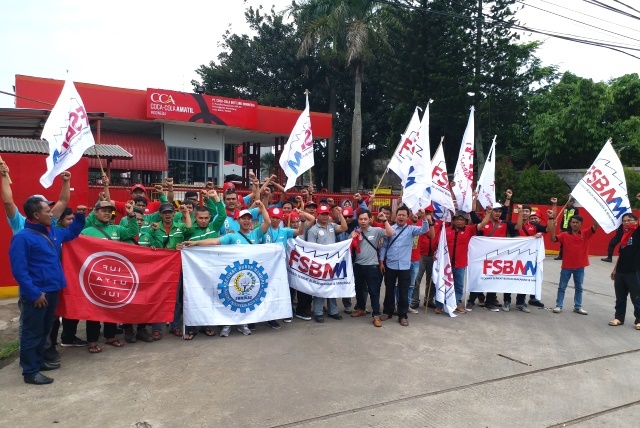 Seven affiliated unions of the independent food workers' federation FSBMM rallied outside the plant on November 13 in support of the victimized union members.